In her new Instructables, BECKY STERN illustrates how to add a voice control feature to an vintage lamp using ESP8266 and Amazon Echo/Alexa. To control the AC portion of the circuit, I’m using a Power Relay FeatherWing– just interrupt the hot lamp wire and plug the stripped ends into the Normally Open and Common screw terminals. Remember, if you don’t know AC, find someone who does to supervise. My lamp had a switch along the cord, so I just removed it and used the wire that the switch had been controlling. Internet has made it easy for computers to synchronize their clocks to an accurate clock value generated by a remote server. We discussed earlier how to make ESP8266-based internet clocks that utilizes National Institute of Standards and Technology’s (NIST) NTS service to retrieve accurate time information and display it on a 4-digit seven segment LED display and on a TFT display. This article from Ayzenberg describes a similar ESP8266-based internet clock that displays time on a large 16×72 LED matrix panel. It also features APIs for displaying messages or setting the display brightness. Tom Tobback built an ESP8266 internet radio based off Edzelf’s excellent Esp-radio project. It uses NodeMCU ESP8266 board for connecting to various internet radio stations and the VS1053 module for decoding the mp3 stream. A TFT display is used in the project to show relevant information such as which radio station is being played. 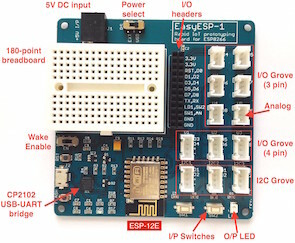 The firmware for ESP8266 is developed using Arduino IDE. The radio also features a built-in web server to allow the user to configure settings and add/modify favorite radio stations. The radio box has a volume control knob and 2 push buttons for channel up and down functions.